The focus of my class for undergraduates is to teach them, “in a rising market buy visionary rocket stocks that are breaking to new all-time highs or bouncing off of support.” They have now completed 5 weeks of classes and are ready to start specifying their set-up for purchases during a trading competition of a virtual 100,000 margin portfolio. I am posting this analysis of LMAT to provide them with an indication of a possible set-up. LMAT came to my attention because it hit an all-time high on 8/30. I looked at a monthly chart using TC2000 and drew in a green line top at the last all-time peak that had not been surpassed for at least 3 months. 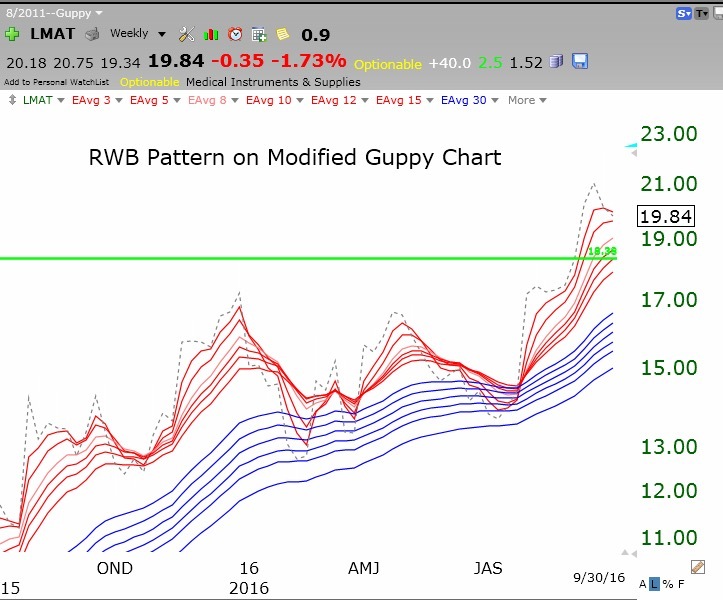 I then looked at its modified Guppy chart of 13 weekly exponential moving averages (six short term and 12 long term averages plus a one week average that shows its weekly closes). I saw that LMAT had an RWB pattern with all 6 short term averages (red lines) rising above the rising longer term averages (blue) with a white space between them. Thus, LMAT had an RWB pattern and is a launched rocket stock. In other words, it was an advancing stock that had rested for at least 3 months (formed a base) and broken to an all-time high. 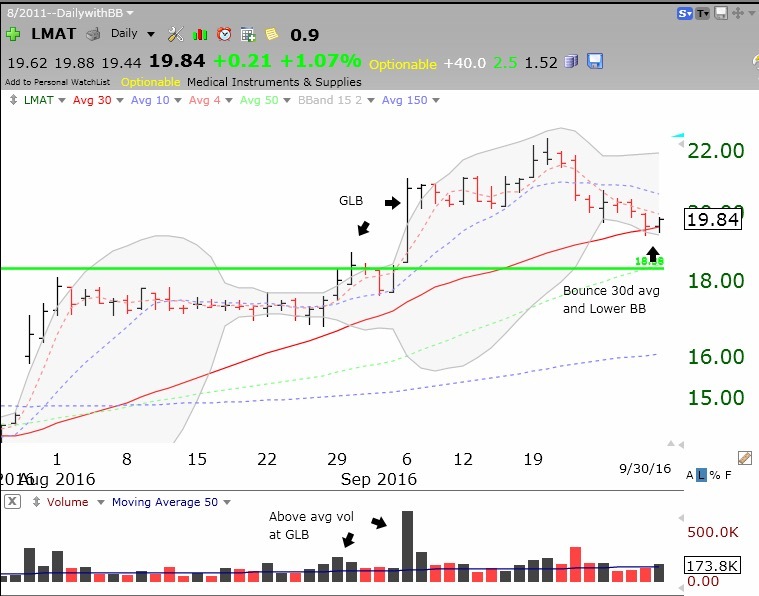 LMAT closed above its green line 2 times on above average trading volume (see daily chart below). The first time the break-out failed, as it traded back below its green line for 3 days. (I immediately sell failed break-outs.) Then LMAT had a much larger break-out on considerably higher trading volume. If I missed that break-out or had exited after the failure, then I wanted to enter this rocket after a decline to short term support and a likely resumption of the up-trend. 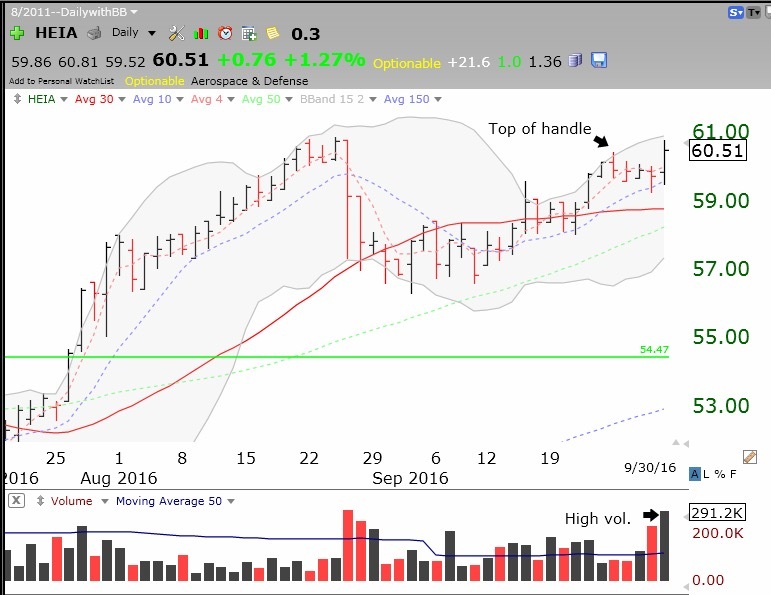 That happened on Friday when LMAT bounced up off of its rising 30 day average and its lower daily 15.2 Bollinger Band on increased volume. This is one of my favorite set-ups. If I were to buy LMAT on Monday I would do so and place a sell stop around the low of the bounce, near 19.29. However, I must sell immediately if the bounce I bought on does not hold. One never knows in advance if a particular set-up will be successful. Of course, I would first check LMAT’s news and fundamentals to make sure that it was worthy of my risking capital to purchase it. For example, IBD gives LMAT a composite ranking of 99, the highest possible reading. I noticed this possible cup and handle break-out from Friday. Note HEIA is above its last green line top–a good sign. It also has a nice RWB pattern (not shown). I do not like the high volume down day in the handle on Friday, just before Friday’s bounce, however. IBD composite rating for HEIA= 98. Let’s see if HEIA holds this break-out on Monday. 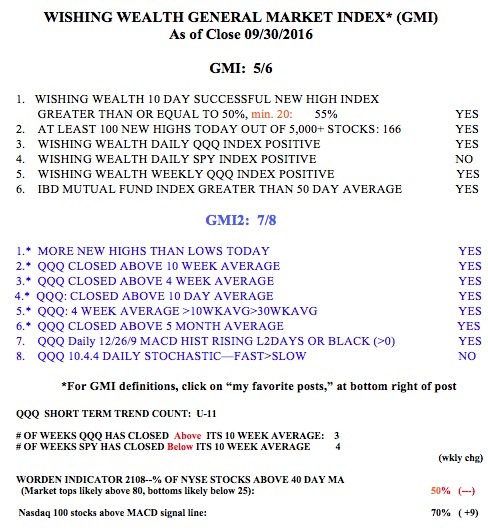 The GMI remains Green. Note the QQQ short term up-trend is now 11 days old. Since that short term signal at the close on 9/16 through Friday’s close, the QQQ has advanced +1.22% and the leveraged 3X bullish ETF, TQQQ, +3.37%. Yes I’d be very interested to read your trading diary! I envy your undergraduate students a lot as they can learn about your trading wisdom firsthand. Don’t envy, go back and ready Wish’s posts, learn from that.